A series of large oval pink topaz stones are surrounded by diamonds and mounted on top of a diamond base studded with additional pink topaz stones in the Württemberg Pink Topaz Tiara, which is mounted in gold and silver. It's a grand tiara and it comes complete with a grand parure including a necklace, earrings, devant de corsage (a large brooch), and two bracelets. The topaz is thought to be Russian in origin, and at least a part of the set may have come to its namesake German family via Grand Duchess Olga Nikolaevna (1822-1892), the daughter of Tsar Nicholas I. Olga married the future King Charles I of Württemberg in 1846. 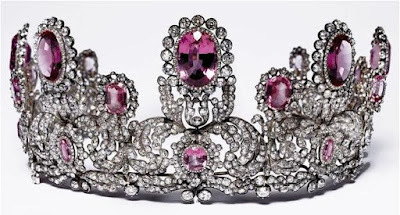 The Russian connection makes sense given the wonderfully deep and vibrant color of the stones, and it's worth noting that the pink topaz demi-parure belonging to the Swedish royal family (which we have discussed in the past) also came from Russia. The tiara opens up to store flat, similar to Sweden's Leuchtenberg Sapphire Tiara. 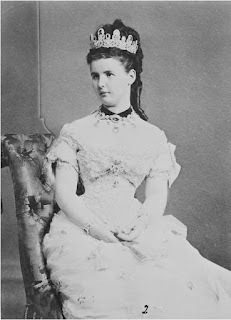 The parure is mainly tied to Princess Marie of Waldeck and Pyrmont (1857-1882), who married Prince William of Württemberg (later King William II) in 1877. Marie died just five years later following complications during the birth of her third child, a stillborn daughter. Her pink topaz jewels are no longer with the Württemberg family and were last associated with the Faerber Collection. Pink stone tiaras aren't as common as those with sapphires or rubies or emeralds, but I think that just makes them all the more striking, especially when they are done up in grand style like this. The more I look at the parure, the higher it climbs on my ever-changing list of favorite tiaras (and, of course, the sadder I become that it is not mine. Alas!). For more on the tiara and to see the full parure in depth, visit Royal Magazin here, here, here, or here. Pink tiaras: yay or nay? P.S. : Two post day! And with double the tiaras, too.